For cancellations at arrival we charge 100 % 1st night and 50 % for the following nights. For cancelations at arrival we charge 100 % 1st night and 50 % for the following nights. Prepaid at departure after checking the rooms. If group members are younger than 18 years old, they can only stay in dorms with private bathroom and they have to book all the beds!!! Our rooms are spacious and nicely furnished, each with their own bathroom or a bathroom shared between only two rooms, so they're ideal for temporary living too! These are the perfect conditions to enjoy your stay in Berlin, if that's being a backpacker, single or business traveler or a group of friends. You can have your nourishing breakfast here in the morning and, if you want to, you can try one of our coffee variations - with a reflecting variation of music playing throughout the day. Tea and juice as well as snacks are of course available, too. Catch us at the bar, where we offer a wide range of beers, wines, spirits and soft drinks. Daily we offer a Happy Hour price, so don't miss it! This hostel was fantastic! It’s so clean and the beds were very comfortable. The luggage storage was very large for each person and they didn’t cram too many beds in a room like I’ve seen with many hostels. You’re able to pick your own bed out of those available. The neighborhood is quiet but close enough to walk to several places. The breakfast is well worth the 5 euro. It was the best breakfast I had my entire trip. Basically great. I would recommend this place to anyone. Great hostel. Large, good facilities and bar and food downstairs. Right by Alexander platz and walking distance to lots of night clubs. A bit frustrating that the location was far away from everything, about half a mile walk from the closest metro. However, the place was very nice and clean. Huge lockers to store all my stuff. Staff was alright, but not super attentive. Stayed in a 4 bed mixed en-suite. It was very secure, clean and spacious. Probably more suitable for solo travellers. Nice and clean with a good environment, however not overly social. The bar seemed quite quiet, so probably not the best if you’re looking for arranged activities. 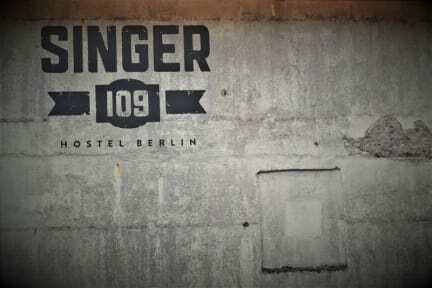 Located in a residential area, quite near Alexanderplatz, which was useful. However, it was a fair walk away from the main sites and more social/cheaper areas of Berlin. Good value for money though. It is a very nice place, clean and comfortable. It is a little bit far from downtown but is all right. It can improve security and a night schedule. The facilities are nice, location is out of the way but a 15 min walk to Alexanderplatz. In the mornings it's incredibly loud as the sound radiates up the interior. Not very social but met a few cool people. Biggest problem was the staff. Never met hostel staff so rude and disrespectful. British guy always at the front desk seemed to not like my friend and I simply for being American, and one of the guys working outside late night was incredibly rude to us. Honestly managers, hire better staff. Good concept in a beautiful building but I feel they could really improve some of the basics. I don't think I would stay again. Some suggestions: fix the showers, i had to hold the shower heads in place. Bolt the bunk beds to the walls they are pretty wobbly, I felt ever twitch from the guy below me. Improve the ventilation in rooms, I could only open one window a tiny bit. Disgusting bathroom; Extremely hot bedroom; Innefective room cleaning.